What a quirky movie. I thoroughly enjoyed watching it. Not an action or war movie, actually quite distinct from other movies. The feel of this movie reminds of something along the lines of The perks of being a wallflower or Little miss sunshine. That 80’s or 90’s feel. This movie is based on a budding senior student Christine who goes by the name “Ladybird”. Residing in Sacramento, California, Christine wants more for herself. She wants an escape along with the freedom that goes hand in hand. Strain between “Ladybird” & her mother is ever so obvious ( I believe she’s pretty hard on her). She wants to attend an Ivy League college but yet again her mother feels her incapable of it. As you know, one see this young easily impressionable girl go through her school year trying her utmost best to achieve the grades along with extra activities required for her admission into the college of her dreams 😛 . At some points you do have a giggle or two whilst seeing how desperate “Ladybird” is in achieving these. Christine & her bestie Julie join the school theatre where you watch her get close to this new-found crush “Danny”. They believe it to be love until she catches Danny making out with another guy – ( How glorious) . What I found quite heartwarming was how she forgave him when he broke down. He’s frightened about others finding out, he too is from a catholic family. 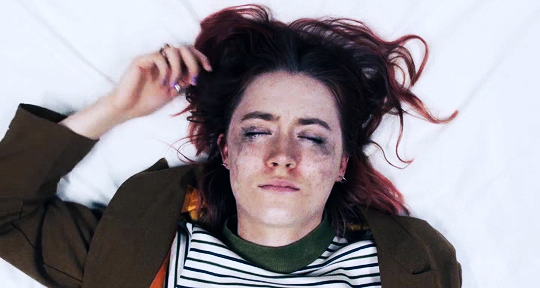 Lady Bird finds a job at a nearby coffee shop & encounters Kyle – young musician ( ooo la laaa). As you’re all aware, when one gains popularity, desiring to be accepted by a certain crowd they forget the friends who were there for them in the beginning. Lady Bird begins applying to east-coast colleges, despite her mother’s insistence that the family cannot afford it. 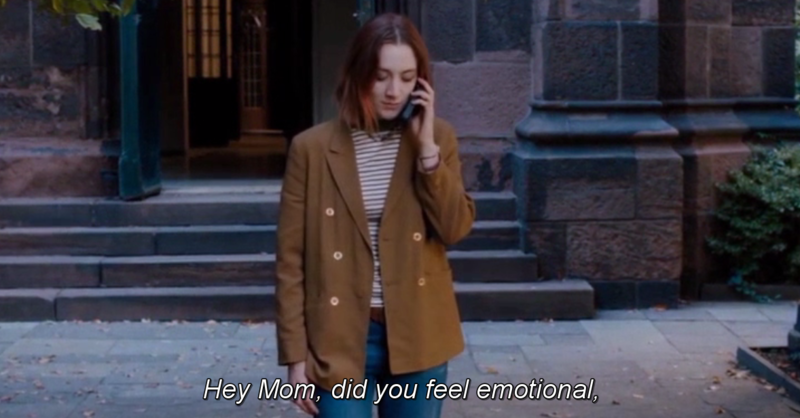 A beautiful scene is where she receives the news that she’s on the “Wait list” for a college in New York! Absolutely ecstatic, Ladybird’s in her dancing mood. However the “populars” have different plans. That’s her lightbulb moment. Ladybird realises shes unlike them, she is who she is. Embracing herself – she requests to be dropped off at Julie’s, heading to prom with her instead <3. A little glitch in Ladybird’s joy – when her mother discovers she had applied to colleges far from home she refuses to talk. Now I found the ending very sweet. You watch how ladybird moves to new York, as she’s unpacking she realises her father had hidden letters from her mother that were thrown away. Revealing how she was truly proud of her daughter yet could not find the words to express it. Christine (sorry I keep swapping names ) passes her driving test and buys a large bottle of alcohol on her birthday since she’s the legal age :’) .. She gets drunk and hospitalised – here’s to the beginning of her college years eh? After leaving the hospital with mascara & makeup smudged all over her face she spots a church. Asking a passer-by what day is it he responds “Sunday”. You see the movie come to an end with her at church service, so its as though she’s travelled a whole circle, even though shes in a new city, has a new life, it’s as if shes back at the beginning or better yet, shes not forgotten what was apart of her life. Hey Mom, did you feel emotional, the first time that you drove in Sacramento? I did and I wanted to tell you, but we weren’t really talking when it happened. All those bends I’ve known my whole life, and stores, and the whole thing. But I wanted to tell you. I love you. Thank you. I’s a cute movie, again it’s not for those who love action or history movies. But worth watching on a sunday night 🙂 .